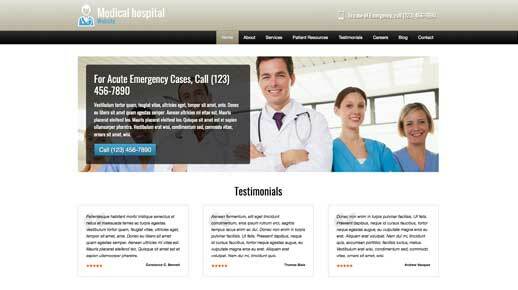 The Medical Hospital WordPress Theme can help generate the perfect online exposure for your health center. 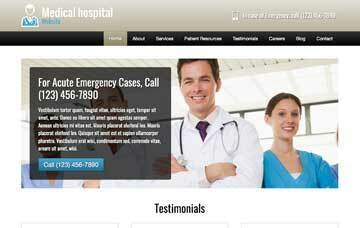 In fact, the Medical Hospital WordPress Theme is so easy to use that even a novice could use it. Just swap the default content with your own and voila! Convince prospective clients of your quality work and friendly service when you create your professional website with the Medical Hospital WordPress Theme. This pre-built website template is designed to make it easier than ever to quickly get your health center service online without any coding at all. Just drop in your own logo, text and photos and it's done! Customizing the color scheme and layout is simple using our powerful front-end visual editing tool and drag and drop widgets. You won't need to rely on a web designer to make small changes like adding photos or blog posts or updating text. There's no need to build your site from scratch when this premium WordPress theme for health center companies comes with added business features to help boost search engine rankings. Take a look at the demo site and see why our Medical Hospital WordPress Theme is the clear choice for health center businesses that need a sleek website fast! The best way to attract new clients with the Medical Hospital WordPress Theme is to do let others do the talking for you. We provide pre-configured pages for you to fill in with your own clients' success stories. The Medical Hospital WordPress Theme's homepage is laid out rock solid. With a beautifully symmetrically aligned service overview for you to showcase your particular skill-set. The Medical Hospital WordPress Theme allows you to attract more customers with the theme's pre-built service pages, you get all of this in an easy to use template. Our Medical Hospital WordPress Theme comes with icons for the most popular social media platforms, with no extra plugins required. Make it easy for visitors to follow you online or share your content. Hiring good people for your health center business starts with a vacancies overview. We've incorporated this feature in the Medical Hospital WordPress Theme. While a contact form is the staple of any website, it is often the most neglected page. Not so for the Medical Hospital WordPress Theme. It goes beyond the standard contact page functionality. No matter what subpage you're on, visitors can quickly navigate to the right information about your cardiology, chiropractics, emergency services and more. 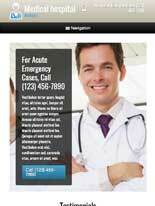 The Medical Hospital WordPress Theme makes it easier than ever to reach customers on their mobile devices. Since the theme is responsive to devices of all sizes, images, text and menus automatically adjust to your customers screens. This way you never have to miss out on quote requests from mobile visitors. There's even a tap to call button that your customers can use to get a live quote!